Granite's vivid natural color palette and near diamond-hard surface makes it the ideal material for countertops. ​Granite is very popular, and for good reason. It offers natural beauty and excellent resilience to wear and tear. Putting Granite in your kitchen or bath is an investment that will last you for years and years. CVCT is a leader in Granite fabrication, and can help you get just the top you're looking for. 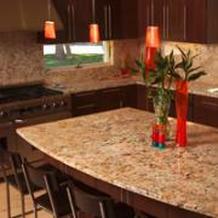 If you would like more color and edge options for your Granite countertops, our custom Granite is perfect. Pick out your slab of Granite in Salt Lake City, and we'll manufacture it just the way you wish. With custom granite, you have all the options.